Thanks! Mostly, it's just a matter of figuring out how I want the deck to tick. 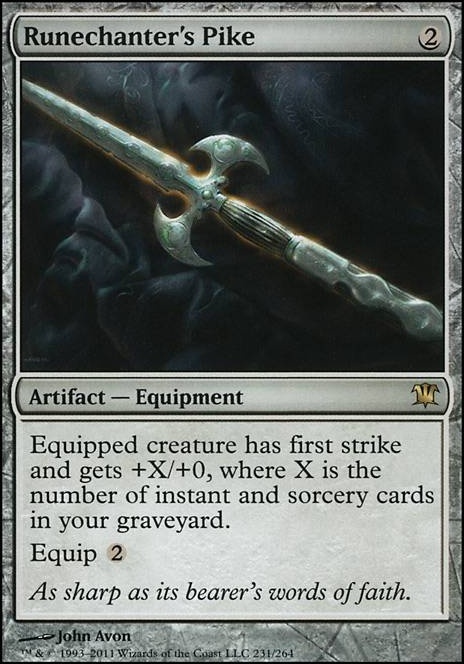 I'd spent a lot of time tuning it under the "no cards greater than a dollar" stipulation, but once build-arounds like Runechanter's Pike start to drag on the budget and I have to cut white to keep the manabase in check, the whole way the deck functions changes. 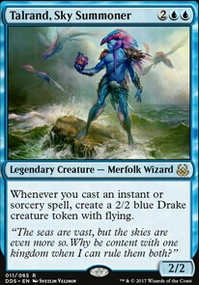 Concentrate for Mystic Remora one mana, that can yield more cards than concentrate ever could. Deep Freeze for Imprisoned in the Moon : Hits more things. Summary Dismissal for Mindbreak Trap : Same cost, but the possibility to be free. Lose out on the ability clause, so Idk if that was meta specific, if so disregard. Circular Logic for Disallow or Delay , either would be better. Circular doesn't scale too well in EDH unless it's mid game and you have very few ways to discard reactively. 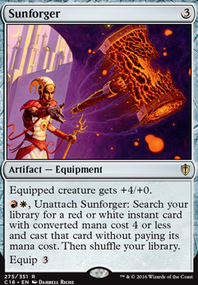 Worn Powerstone for Basalt Monolith : It's cheaper (money-wise) and the turn you waste with a worn powerstone for two mana is strictly worse. Runechanter's Pike for Fleetfeather Sandals flying seems great, but first strike plus all those spells you've been unloading into the grave sounds a bit stronger. 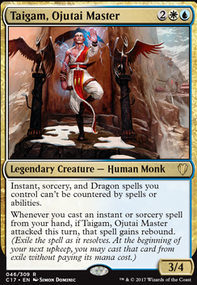 Considering how this is a voltron-esque deck, I am only going to pitch it, so you're aware. 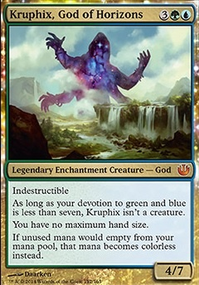 However, with 2 more rocks (ex: Gilded Lotus ) you can actually add Dramatic Reversal for the Isochron Scepter combo and go infinite mana. Though, you would need an outlet for this mana. @Control_Train I can see what you mean with veilstone. 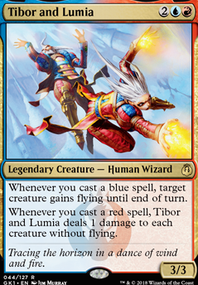 I'm going to lower my CMC in my SY - I've got an izzet build that can probably put some of the more decadent cards to better use for a grindier game - and it's telling that veilstone is actually cheaper tech for my deck, and I'm skewing too high anyway. I'm going to try it in the same sort of role as Mother of Runes I think, potentially being able to make use of it multiple times in a turn cycle if needed. Speaking of, did you find that MoR filled the same role as having a bunch of protection/indestructible cantrips? Do you find yourself missing them now? Does that provide enough coverage when you don't draw Swiftfoot Boots ? Or maybe it's easy enough to cycle through most of the deck with all the cantrips... Runechanter's Pike and Hero's Blade are too good of an opportunity to pass up on, Steelshaper's Gift or Open the Armory will probably find a home. Curator's Ward has been working well for me too, speaking of auras, as has Shimmering Wings . That's a good point about the nature of SY as a voltron commander, do you mean more in that all the boosts are coming from Shu Yun alone? The */X fliers plan doesn't seem like a bad back-up. That's where a small tokens package seems like it could offer some adaptiveness too. What kinds of tables do you find your deck underperforms at? I usually only get in two games a week, only about half of them lasting more than ten minutes (it's a 1-LGS town with a pretty competitive meta), so I don't get to test new tech or themes much. It's cool to see how other people are solving the same problems through other decks here though. Maybe As Foretold to gain some free casts so you can cast more spells each turn? Its on the expensive side but Sensei's Divining Top so you can access more instants and sorceries to keep casting. 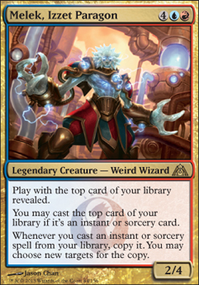 On the cheaper side, Crystal Ball for the double scry to set up that top card of the library. I don't know that you have enough dragons to make Dragonstorm worth it. I also wonder how effective Runechanter's Pike is in this deck. If your commander had some evasion built in then maybe.